We're big fans of this guitar and, aside from the rough frets - solved in minutes with a polishing kit - it's highly recommended. Warm mahogany tones. Tight chords and evocative fingerstyle sounds. Lots of tone-tailoring options plugged-in. The first thing we notice with this guitar is how attractive the mahogany top is. The R-15E's gloss finish brings out the subtle grain nicely, and the finishing is of a high standard. The understated black and white pinstripe binding embellishes proceedings well, and if you're turned off by too much abalone, this guitar is quite the tonic. "Evocative fingerstyle passages come to life thanks to the inherent mahogany warmth"
Farida describes the body shape as 'Richtone', and as such, it features a narrower waist and more rounded shoulders than the arguably more familiar dreadnought design. The headstock is home to the chrome-plated tuners, and is faced with a mahogany veneer, while the fingerboard is made of sonokelin and sports 20 frets. We're being picky, but the finishing on these frets could be a little smoother. The R-15E also features Fishman's impressive Presys Blend system, which includes a piezo pickup and a built-in mic, with the rear strap pin doubling as the jack input. 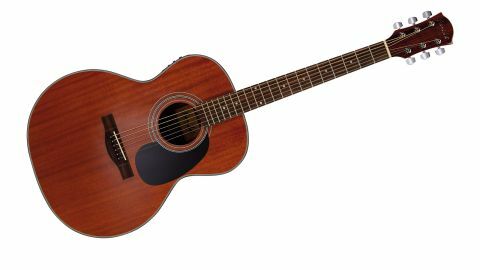 There's a tightness to the acoustic tone that works well with strummed chords, while evocative fingerstyle passages come to life thanks to the inherent mahogany warmth. When plugged in, the Fishman has all manner of tone-tailoring functions, not least a pot that lets you blend the mic signal with the piezo for a true tonal balance. Along with the three-band EQ and associated notch control, you're always in charge of your amplified sound.